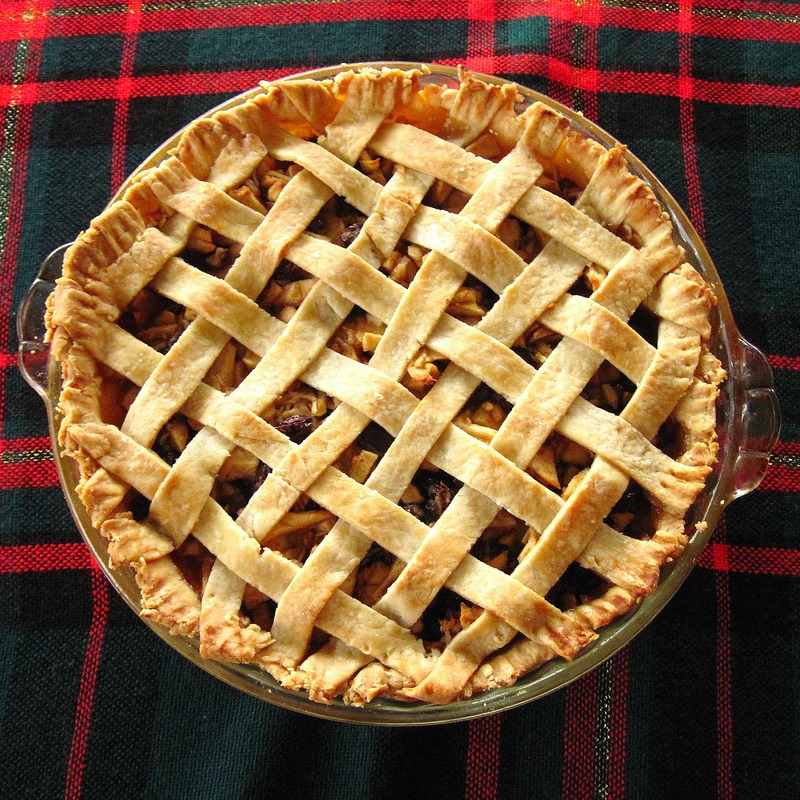 “Real” Mincemeat Pie is made with finely minced meat. 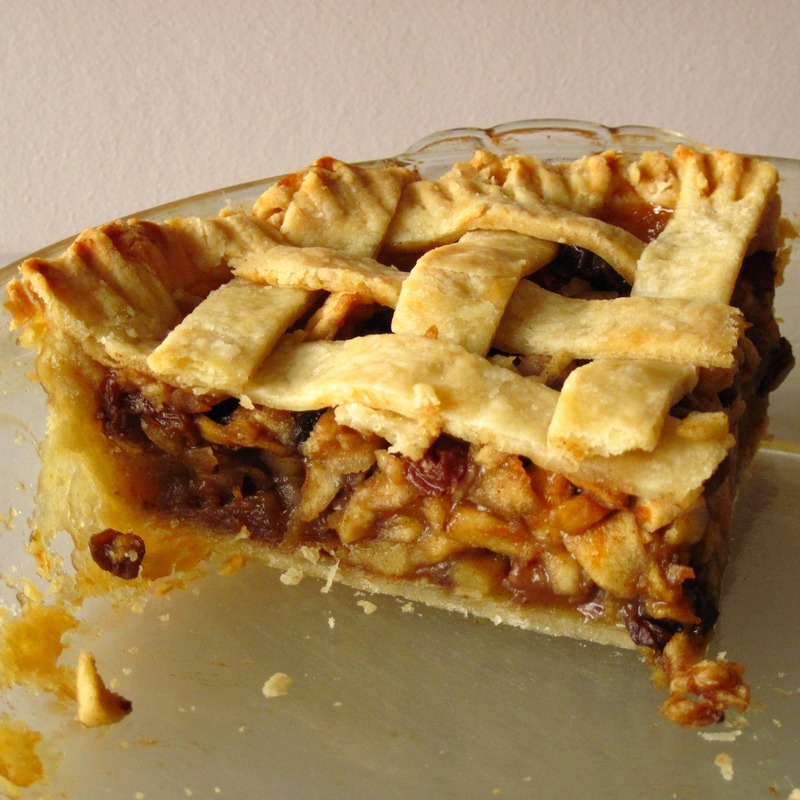 This Mock Mincemeat Pie is made with apples, raisins, and spices. I prefer it to the “real thing”, which I did actually make once – many years ago. 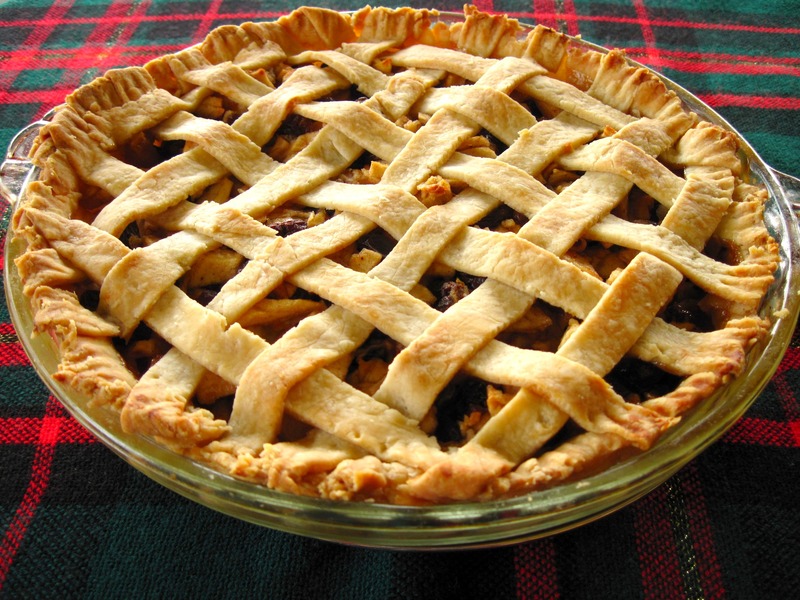 I once followed Julia Child’s advice (in The Way to Cook) for Mincemeat Pie. Julia suggested using a jar of commercial mincemeat, and then freshening it up with chopped apples, raisins, nuts, and spices. It was quite good, but I decided I wanted to make it without using the jarred mincemeat. This is the Mock Mincemeat Pie that I came up with, and the mincemeat lovers in my family always enjoy it as part of our Christmas dinner. We did a lattice-top crust, which is really quite easy. This is the method I use, although I arrange the dough strips at a 90˚ angle instead of the 45˚ angle demonstrated on the link. You can certainly just make a regular double crust pie, if you prefer. 1. Place a large cookie sheet in the oven and preheat to 375˚. 2. Combine apples, raisins, salt, cinnamon, cloves, ginger, and orange zest in a large bowl. 3. Stir the honey, maple syrup, and flour together. Stir into the fruit mixture. 4. Turn the fruit mixture into the pastry shell. 6. Finish the edge around the pie. 7. Bake for 55 minutes or until the crust is golden. 8. Cool on a wire rack before serving. ← Superb Grilled Ham and Cheese Sandwich! Thanks, Mary! Carrie did make it back to the winter wonderland in Boston yesterday. Thanks, Treat and Trick! Happy New Year to you! I have never had any type of mince meat before, your version I could definitely handle! I’m not so sure about real minced meat….. Thanks, Dennis! Happy New Year to you and your wife, too! Christmas is over but I could still eat somemore pie! This looks delicious! Happy holidays! I hope you have an awesome and safe New Year! I love a good mincemeat pie! So very rich that a small slice will do fine with tea! In my family, we make and can mincemeat in late September, using green tomatoes along with the ingredients you have listed. It makes a very tart and heavy mincemeat that is so rich! The recipe has come down through the family from my great-grandmother and,for a while, was a closely guarded recipe (I always wondered why!) My mother finally gave it to me when she became unable to do the huge amount of canning, baking, and cooking that it took to feed our huge family. Excellent mincemeat !! Your crust is picture perfect too! Susan, I bet your canned mincemeat is fantastic! I’m sure it’s probably richer than my version. I love that it’s a family recipe. Thanks for your comment! Carrie will love that you liked how her crust turned out! Thanks, Kori. 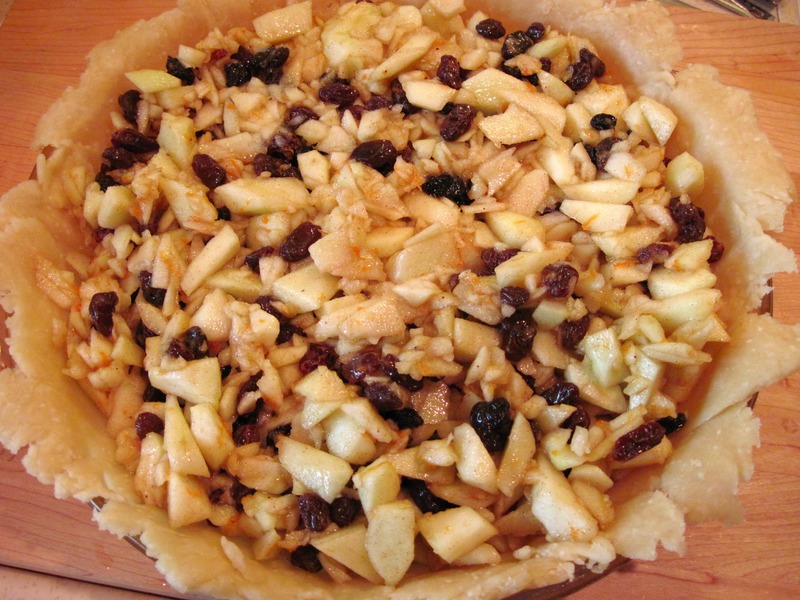 It is a fun pie to make, especially for the holidays. Happy New Year to you! Just beautiful! 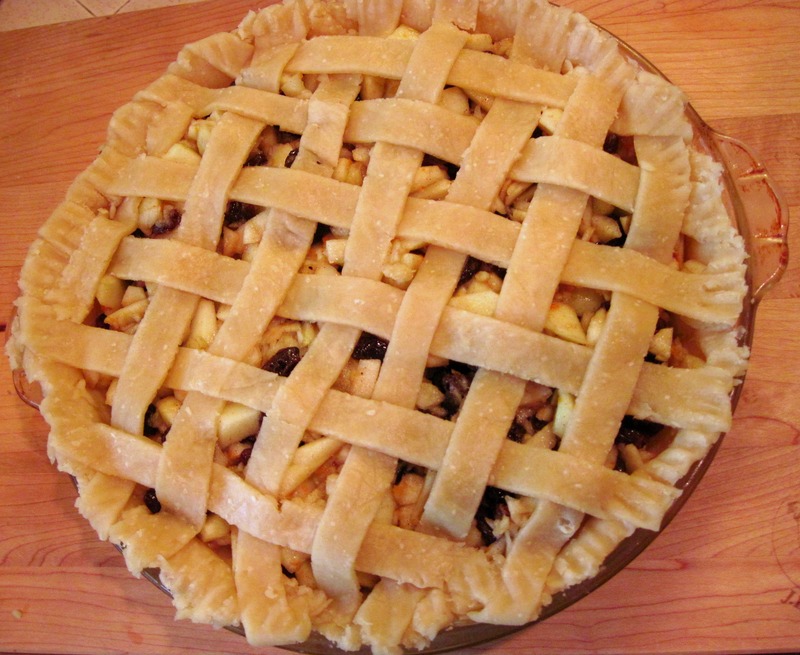 Your lattice on that pie…stunning! And I love your “mock” version of mincemeat. I would prefer this version any day. Carrie is so cute…I’m glad that she was able to get back home. What crazy weather! Thank you for sharing this recipe with me. 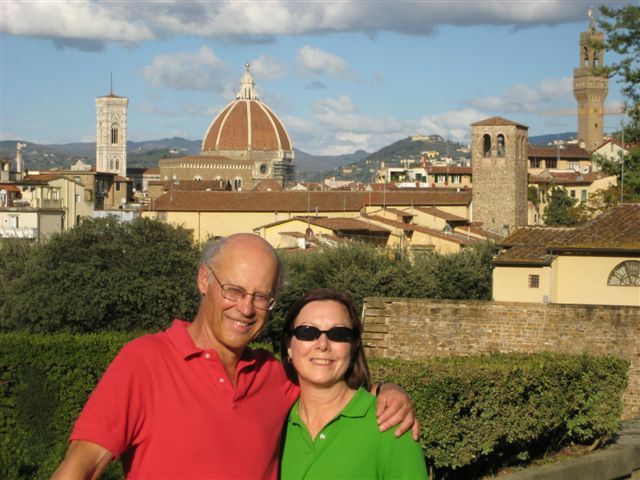 I wish you and yours a blessed weekend and new year! I have never had either kind of mince meat either, but would probably prefer the “mock one”. Your lattice crust is beautiful. Glad that your daughter got back to Boston safely. I just found out my friend loves mince meat pie but his wife hasn’t ever made it for him. They’ve invited us over for dinner next weekend so I’m going to make him a mince meat pie. I love how easy your recipe is so I’m going to give it a try. Can’t wait to surprise him.